Nanotechnology can help solve many problems. But it is a technology that involves risks as well, for people and for the environment. In a PhD study conducted at Alterra Wageningen UR and Wageningen University, doctoral candidate Merel van der Ploeg explored the effects of nanoparticles on soils. Caution, it turns out, is still called for in nanotechnology's use. Nanotechnology is a rapidly growing area in which extremely small, artificial particles (< 100 nm) are utilised in applications ranging from food, sporting goods and health and beauty products, to numerous types of computers and other equipment. Nanoparticles can serve, for example, as a 'vehicle' for delivering medicine to just the right place in the human body (down to the cell), for 'miniturisation' of computer chips, for water purification filters and in food, for instance, to improve taste, texture and 'mouthfeel'. Given their increasingly widespread use, more and more of these particles could be released into the environment, resulting in growing exposure of people and organisms. The reactivity and persistence of nanoparticles are other reasons for worry. About their dangers, however, too little is yet known. "To better understand the risks that nanotechnology poses to the environment, I did research on the effects of nanoparticles on earthworms", says Merel van der Ploeg, who will defend her PhD on the subject 30 January. 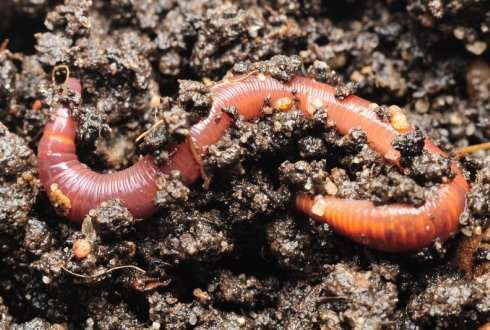 "Earthworms are actually a good indicator of soil quality." One of the topics that Van der Ploeg studied was the effect of carbon nanoparticles (C60) on earthworms. She found that exposure to nanoparticles could have serious consequences for earthworm populations – such as reduced reproduction, slower growth and higher mortality. Young worms, in particular, are sensitive to the effects of nanoparticles. "I also found damage to the skin tissue and intestinal wall, often accompanied by damage to the underlying muscle", says Van der Ploeg. "But even though tissue damage is usually associated with inflammation, I did not observe this in the earthworms. There seemed to be a suppression of the immune system." Van der Ploeg obtained similar results when earthworms were exposed to silver nanoparticles (AgNP). Nanotechnology has great potential to contribute to solutions for societal problems. "But," warns Nico van den Brink, academic supervisor and researcher at Alterra, "without proper assessment of possible adverse effects on human health and the environment, public acceptance of this new technology could wane. By charting the effects of nanotechnology in terms of risks to the environment, Merel's research will contribute to better decisions being made on these technologies."